We wrote this the night we heard of his passing. I have been amazed that no one liked or disliked this post. It turns out that somehow I did not post it. Better late than never? Maybe, or maybe not. Check it out, if his life interests you. We lost Robin Williams today. Despite his long and wonderful career brightening the lives of so many others, he could not find enough light in his own life to keep the candle burning. I’ve experienced mild depression, and felt so bad then I couldn’t get out of bed for days. Severe depression had a hold on Robin, and it somehow convinced him that not being was preferable to living under that terrible condition. Williams became a cocaine addict along with the only actor of any note to perform before an audience of just Kat, Jackson, and an unnamed guy from Illinois. I’m talking about John Belushi, on Bourbon Street after doing Saturday Night Live circa 1976. 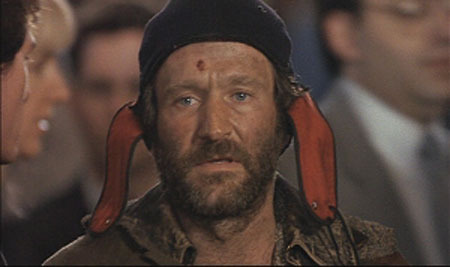 Belushi’s demise helped Williams quit coke, but “So did the grand jury.” Later in life Robin did stand-up with Billy Crystal, and co-starred in Waiting for Godot at the Lincoln Center with Steve Martin. Wouldn’t you love to have seen that one! Does Netflix have that on a disc? I never saw his Mork character on Happy Days. I didn’t watch Mork and Mindy either, but I do remember “Nan-oo, nan-oo!. I just didn’t see a lot of television back then. But Williams must have been good. 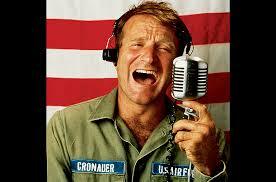 Between my infantry training for that war, and his great performance as Adrian Cronauer in Good Morning, Vietnam! I could smell the place. After seeing Dead Poets Society I wished I had been an English major, money be damned. 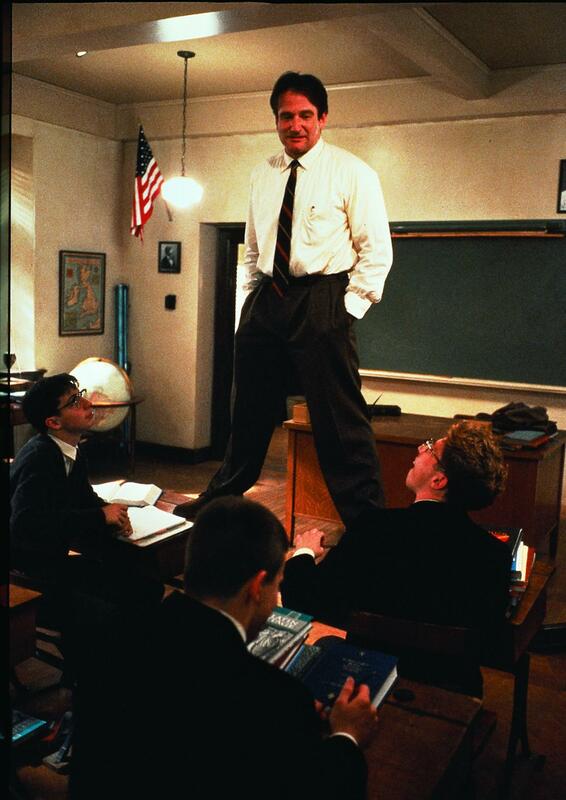 And I remembered, with smiles and tears, the three educators who had made a difference in my life, and at times came close to being John Keating, “Oh Captain, my Captain!” the new instructor of poetry at Welton Academy. He was wonderful in The Fisher King, and a lot of people really enjoyed Good Will Hunting where he won some long overdue recognition in an Oscar for Best Supporting Actor. But he was human. His three wives helped him spend every dime, and there was some unfortunate overlap between them, as in each leading to the demise of the one before. He was mostly sweetness and light, but you can’t do standup without hurling a few F-bombs. Play this after the chirrens are asleep. 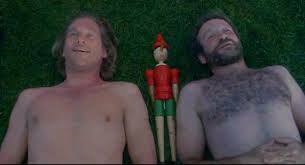 It’s a side of Robin Williams you may have missed. It is also a fine explanation of why I gave up golf. 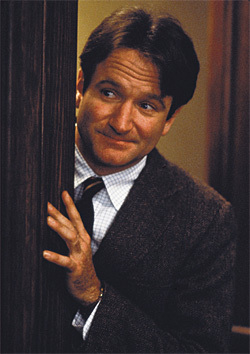 Rest in peace, Robin Williams. I won’t forget you. You are indeed lucky to have had that show all to yourselves, plus the guy from Illinois. The first time I ever saw him, I thought this guy would be funny if he read the phone book, and it was true to the end. It was heartbreaking to know he thought he had to go at all, then so early, and in such a manner. Maybe a diagnosis of early Parkinson’s, along with the depression, might have been the last straw for him. We’ll never know. Whatever happens after death, I hope he has found some peace. He will be missed.